A week after we left Switzerland my mini is in a hangar hung up again that the left work on it can be started right away. 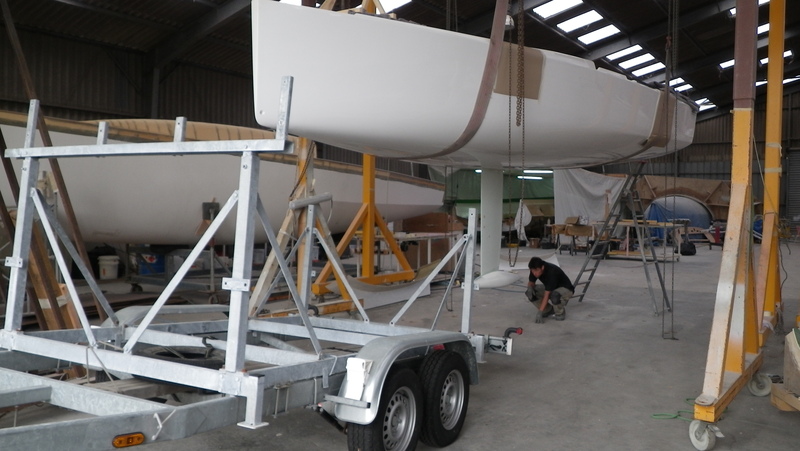 Lucky enough we planned to stay a few days in Lorient, then the boat had no keel fitted and the mast was still a few hundred miles at the mast builder, but I guess this is just normal, the guys in the yard had a busy few days then it was 14th of july on thursday and everyone in France is off work. The keel got bolted on and we loaded the boat up with all the bits and pieces which still have to be fitted, like all the deckhardware and electronics. On Wednesday 23th at 7pm well after workinghoure for a day before holiday a not so happy truck driver arrived with mast boom and bowsprit. 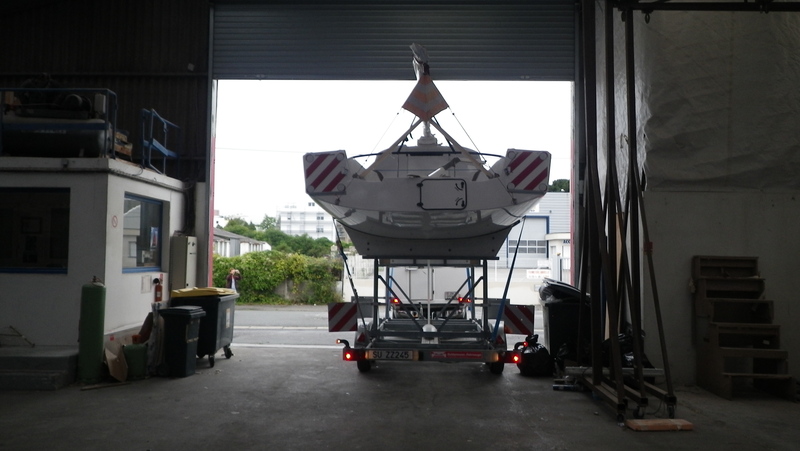 So we could load the trailer with boat and mast, the only thing missing was only the permit to drive trough france with over-width (3m), then for some reason the department of transport in france wasn’t able to send a copy by email and had to post the documents to Switzerland :-S, for Switzerland it took 3h and I had the permit as email in my inbox. Now my room is full of boxes which are full of parts which still have to be fitted to the boat and my face is still white from sanding the bottom of the boat, so lots of work to do! This entry was posted on July 20, 2011 by simonkoster. It was filed under Uncategorized .